America is an increasingly conservative nation, by ideology and by political affiliation, according to polling results from the Gallup Organization. While conservatives have long outnumbered liberals and moderates across the U.S., the study sheds new light on state-by-state patterns. The map below shows the pattern for the 50 states and the District of Columbia. Mississippi is the first state with more than 50% conservative identification, with Idaho, Alabama, Wyoming, and Utah approaching that level, and Arkansas, South Carolina, North Dakota, Louisiana, and South Dakota (the rest of the top-ten conservative states) 45% or higher. Conservatives outnumber liberals in even the most liberal-leaning states (excluding the District of Columbia): Vermont, (30.7% conservative to 30.5% liberal), Rhode Island (29.9% to 29.3%), and Massachusetts (29.9% to 28.0%). Political commentators have long pointed to underlying social and economic sorting that underpins this growing conservative/ liberal divide. But what factors account for the growing conservatism of Americans and American states? With the help of my colleague Charlotta Mellander, I decided to take a look. We ran a simple correlation analysis on the Gallup poll numbers, comparing conservative identification to a variety of key economic, demographic, and cultural factors by state. As always, our analysis only points to associations between variables; we do not make any claims about causation and note that other factors that we have not looked at might come into play. Still, a number of intriguing findings cropped up. Not surprisingly, states with more conservatives are considerably more religious than liberal-leaning states. 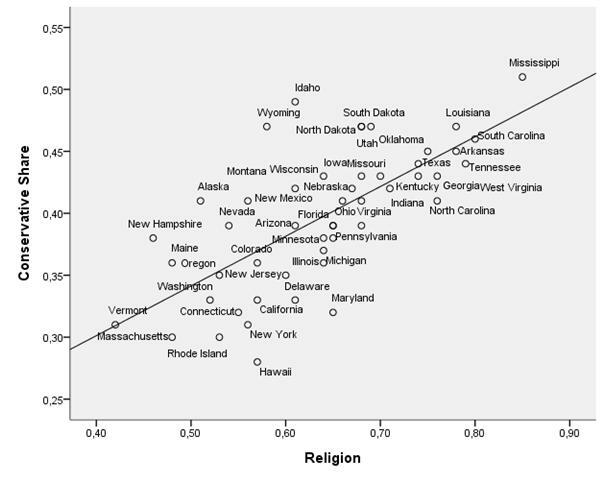 The correlation between conservative political affiliation and religion (the share of state population for which religion is an important part of daily life) is considerable (.63). 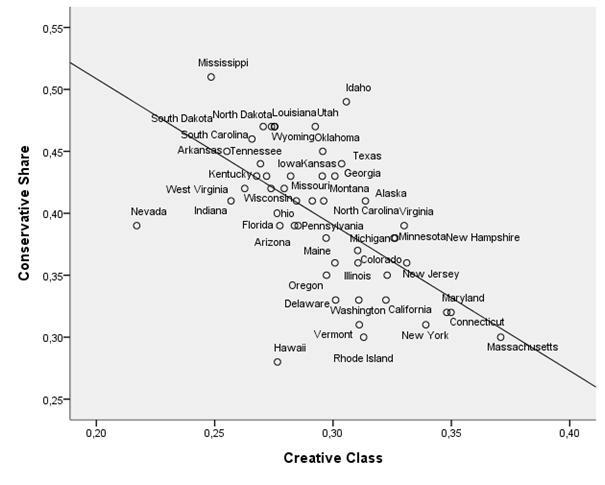 Conservative states are also less well-educated than liberal ones. The correlation between conservative affiliation and human capital (that is, the percent of adults who have graduated college) is substantially negative (-.53). 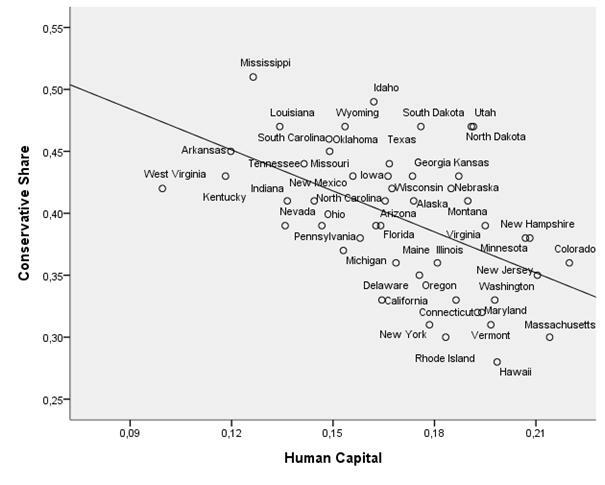 States with more conservatives are less diverse. Conservative political affiliation is highly negatively correlated with the percent of the population that are immigrants (-.59) or gay and lesbian (-.66). Conservative states are more blue-collar. Conservative political affiliation is strongly positively correlated with the percentage of the workforce in blue-collar occupations (.73) and highly negatively correlated with the proportion of the workforce engaged in knowledge-based professional and creative work (-.61). 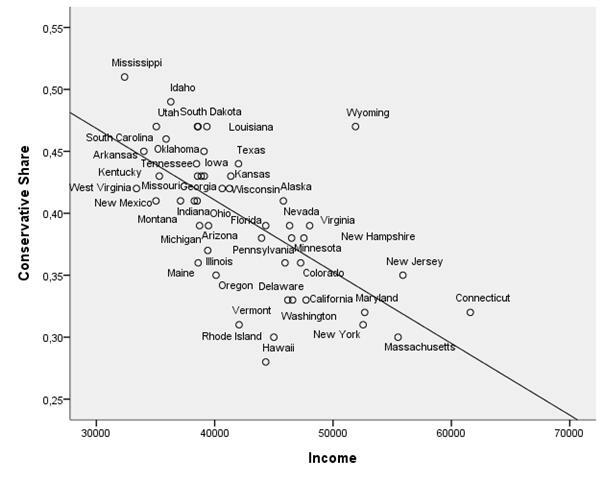 States with more conservatives are considerably poorer than those with more liberals. Conservative political affiliation is highly negatively correlated with income ( -.65) and even more so with hourly earnings (-.79). Columbia University's Andrew Gelman's influential book Red State, Blue State, Rich State, Poor State sheds light on this phenomenon. While rich voters trend Republican, Gelman and his colleagues found, rich states trend Democratic.